High speed Mini HDMI - HDMI cable 1.5m High Definition. 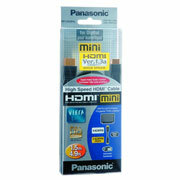 Supports transfer of HD video and audio, including full HD 1080p. Supports 10.2Gbps. 1.5m (4.9ft) cable length the HDMI (High Definition Multimedia Interface) cable is suitable for many devices including TVs, Plasma and LCD, HD digital cameras, and video camcorders, video projectors, including Panasonic devices such as Viera Link PDP TVs etc.